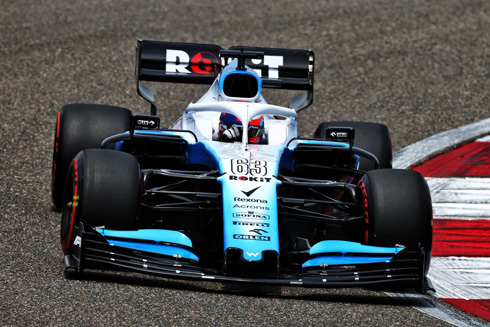 The results of the 2019 Chinese GP would see a repeat of the previous races for the ROKiT Williams Racing Team. Both drivers would finish two laps down with George Russell finishing in 16th and Robert Kubica 17th. Again both drivers would struggle ending in positions that were all that they could really hope for given the issues that they are still having with the FW42. 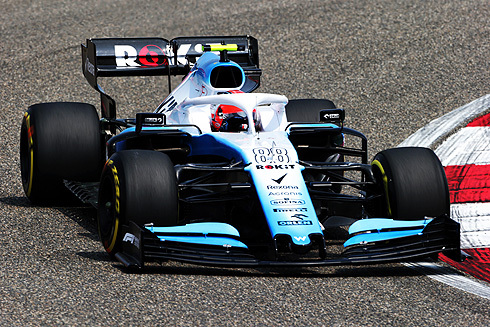 The fifty six lap 2019 Chinese Grand Prix would see the ROKiT Williams drivers start from 17th and 18th on the grid with George Russell ahead of Robert Kubica. On pole was Bottas from Hamilton, Vettel, Leclerc, Verstappen, Gasly, Ricciardo, Hulkenberg, Magnussen and Grosjean tenth. of the top ten the Mercedes, Ferrari's and Verstappen would all start on the medium tyre. The rest of the top ten would be on used soft tyres. As for the Williams drivers they both would start on the medium tyre. Outside the top ten it would only be Albon and Giovinazzi who would start on the soft tyre with Albon starting from the pit lane. The grid would complete their parade lap with Verstappen having spun trying to warm his tyres. Robert would also have the same issue but both drivers would recover. With the start it would be Hamilton leading from Bottas, Leclerc, Vettel, Verstappen and Gasly. But there would be crash between Kvyat and Norris seeing the McLaren fly into the air with both dropping to the rear of the field. Sainz would also be involved. This would see a Virtual Safety Car deployed to allow for the removal as both McLaren's pitted with both having to get new noses. Kvyat had also pitted. As for the Williams drivers they were running in 14th and 17th with George ahead of Robert. George would drop to 15th as Giovinazzi passed him on the softer tyre. Lap five and the Williams drivers were 17th and 18th only ahead of the McLaren's. The McLaren pair were some thirty seconds behind the Williams drivers as on lap nine Giovinazzi and Kvyat would pit. The Alfa Romeo driver would switch to the medium tyre while Kvyat had received a drive through penalty for his part in the accident with Norris. Grosjean would pit on lap ten going to the hard tyre joining the McLaren's. Magnussen would also pit on lap eleven also changing to the hard tyre. Ferrari would tell Leclerc to let Vettel pass as the pair had dropped away from the leading Mercedes. Verstappen was in fifth followed by Gasly, Ricciardo, Perez, Raikkonen, and Stroll tenth. lap thirteen and Hulkenberg had pitted switching to the hard tyre. The Williams pair had moved up to 12th and 13th but other drivers would start to pass Robert seeing him drop to 17th. George was still in 12th but Kvyat was right behind him as Robert ran in 17th. Lap nineteen and Hulkenberg would retire in the pit lane. Kvyat would pass George seeing the Williams now 13th. Verstappen would pit on lap nineteen and would swap to the hard tyre. George would drop to 15th as both Haas cars passed him. Lap twenty and Norris would pit with a front wing issue as Vettel also pitted taking on the hard tyre. Ricciardo had also come in taking on the hard tyre. Verstappen and Vettel would be fighting over fourth as the Williams drivers were now in 15th and 17th with George leading Robert. Lap twenty two and both Racing Point cars had pitted. Bottas would pit on lap 23 taking on the hard tyre. The Williams pair were now 15th and 18th joining the McLaren's who were 17th and 19th. Leclerc would pit on lap 24 taking on the hard tyre seeing him return in 5th. Lap 25 and George would pit switching to the hard tyre. He would drop to 18th ahead of Norris. Hamilton had also come in taking on the hard tyre retaining his lead. Lap 26 and the order was Hamilton, Bottas, Vettel, Verstappen, Leclerc, Gasly, Raikkonen, Ricciardo, Perez and Grosjean tenth. The Williams drivers were 17th and 18th with Robert leading George but Robert had yet to pit. Raikkonen would pit on lap 27 returning in 10th and on the hard tyre. Robert would make his pit stop on lap 29 also taking on the hard tyre. Kvyat had pitted again switching to the soft tyre on lap 35 seeing George 16th. Robert was now 19th while both Williams drivers had been lapped. Lap 36 and Magnussen would pit going from the hard to the medium tyre. Verstappen would do the same with the Red Bull remaining in 5th. Vettel would be told to pit on lap 37 taking on the medium tyre returning in 4th. More drivers would start to pit with Hamilton coming in joined by Bottas. Grosjean had also pitted with all three switching to the medium tyre. Sainz would pit on lap 39 taking on the soft tyre returning in 15th. The Williams drivers were now running in 16th and 18th. Leclerc was in second and under attack from Bottas with the Ferrari on very used tyres. Bottas would finally get past Leclerc using DRS on the main straight. More drivers had pitted with the order now Hamilton, Bottas, Leclerc, Vettel, Verstappen, Gasly, Ricciardo, Perez, Raikkonen, and Albon tenth. Kvyat would pass George for 16th seeing the Williams drivers 17th and 18th while Leclerc would pit coming out in 5th behind Verstappen. Kvyat had also pitted retiring in the pits. 16th and 17th for the Williams drivers. Lap forty nine and the top ten had remained the same with Hamilton leading by over seven seconds. Russell would pit on lap 53 taking on the soft tyre for the final laps to the flag. Norris would retire on lap 54 within sight of the flag. This would see the Williams drivers running in 16th and 17th. Gasly would also pit returning in 6th ahead of Ricciardo and on soft tyres and looking to get the point for the fastest lap. The race would end with Hamilton taking an easy victory from Bottas, Vettel, Verstappen, Leclerc, Gasly, Ricciardo, Perez, Raikkonen and Albon taking tenth. Gasly would take the fastest lap and get the point. 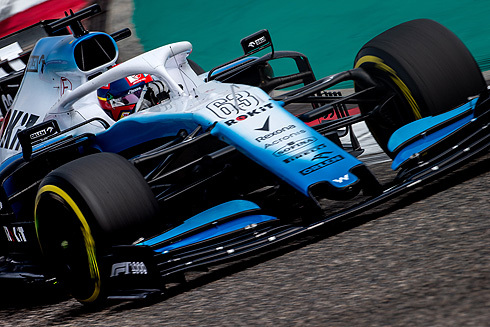 The Williams drivers would finish in 16th and 17th in what was a further repeat of their race performances of the other 2019 races. Nice to see both drivers fighting each other towards the end of the race. It's a shame Robert didn't have a good pit stop, which cost him time. Of more significance, it was interesting to see Robert pit just once, and Russell twice. I didn't think the Williams car was capable of one-stopping, even though the car is very slow. Before the season, I was concerned about Kubica's tyre preservation skills, but he's doing a very good job so far. Same for his one-lap speed, which I feared might be lacking. "We had clean, well-driven races from both drivers and were able to execute a sensible one-stop strategy with Robert. We tried a similar strategy with George, but the length of the stint and the loss of some tyre temperature meant that ultimately, we opted to pit George for a second time and allow him to finish the race on a new qualifying tyre." That's quite interesting about Russell. 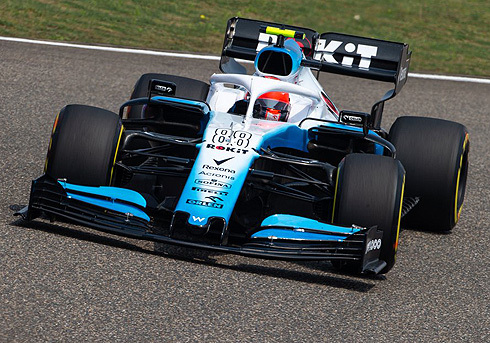 Kubica did 4 more laps on the same tyre on his opening stint. I wonder if Russell has fully adapted to F1 tyres yet, coming from the F2 tyres which are a different size and construction.